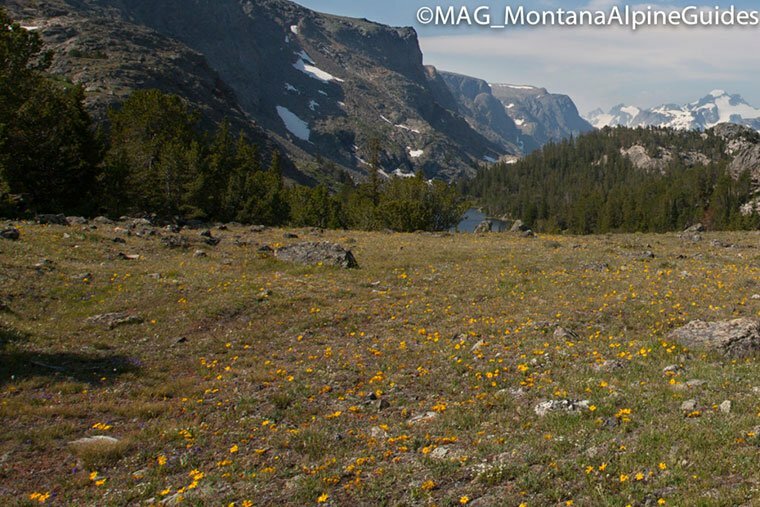 GANNETT PEAK (13,809′ or 4,209 m) is the highest point in Wyoming. To add to its list of “high points” Gannett Peak is also the highest point in the Greater Yellowstone Ecosystem as well as the highest peak/point in the Rocky Mountains outside of Colorado. 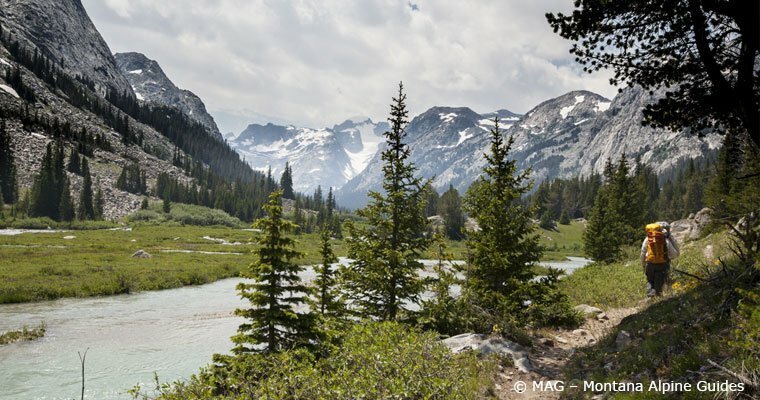 Gannett is situated deep in the heart of the beautiful and rugged Wind River Range. Among mountaineers this peak is known to be the most difficult summit of the 50 state’s high points, after Denali (Mt McKinley) and perhaps Montana’s highest point, Granite Peak. Much of this is owed to the fact that it is more than 20 miles from most trailheads. MAG (Montana Alpine Guides) offers guided climbing trips on Gannett Peak from the Cold Springs trailhead by way of the Wind River Reservation. 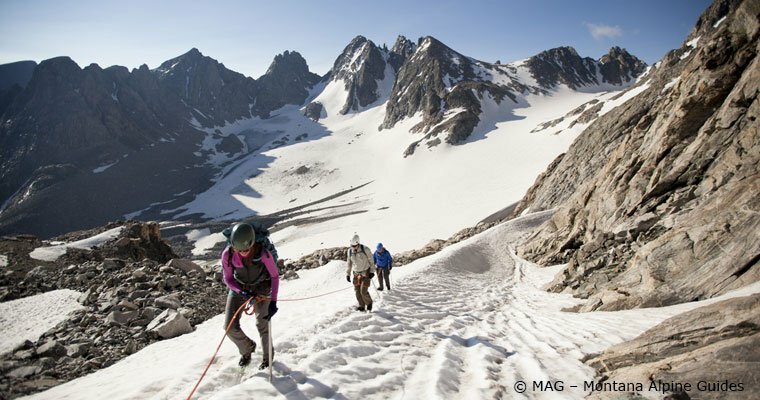 We choose this route because it is the most effortless and arguably the most beautiful approach to climb Gannett Peak. 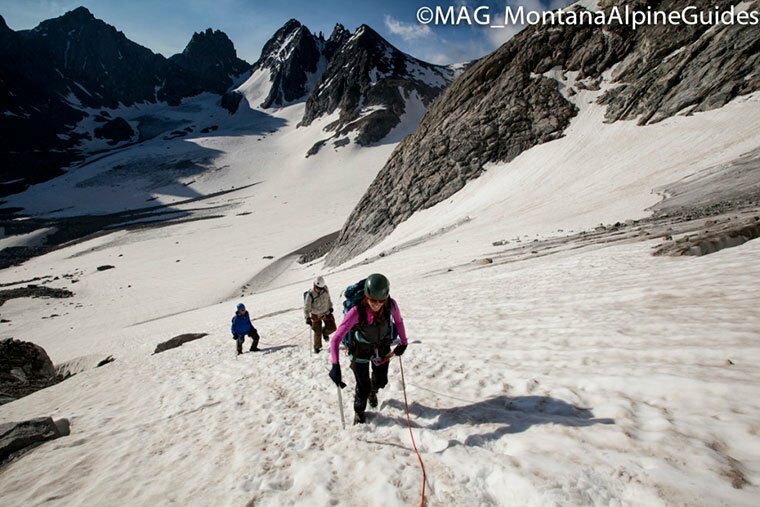 After all we assume most climbers have two priorities; one, to get to the summit of Gannett Peak, and two, to enjoy the journey along the way. Stacking the odds in our favor can allow participants to take in more of this rugged landscape as we make the two-day approach in to climb Gannett Peak via it’s easiest approach. 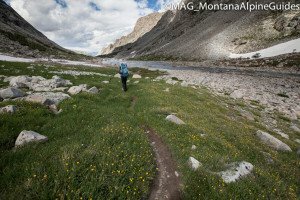 WHY CLIMB GANNETT PEAK via COLD SPRINGS opposed to Elkhart/Titcomb Basin? Quite frankly, it’s easier, as it offers the shortest approach to climb Gannett Peak, the least amount of vertical gain and loss, and it is typically less crowded. Apart from the easier approach the summit day from this approach is far easier as it eliminates climbing up and over Bonnie Pass and subsequently going back up and over Bonnie Pass again after you summit. Apart from these perks this route is also amazingly beautiful (see photos) and so no scenery is sacrificed by taking this route. Nonetheless Gannett Peak is still a massive mountain that demands much respect no matter which way you approach the climb. There is $325/participant cost to the Wind River Reservation. However if you access Gannett Peak any other way you will need at least one more day, in which guide fees apply (~$500-$800/day) and the cost for mules and a handler. 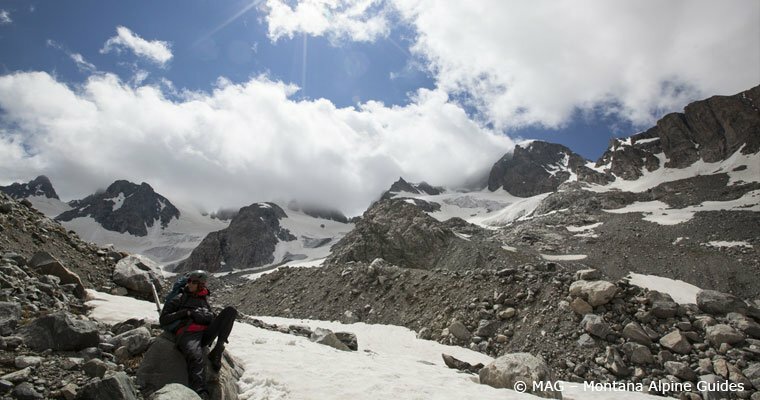 Trip Duration: We suggest 5 days, with an optional 6th day for bad weather or rest. 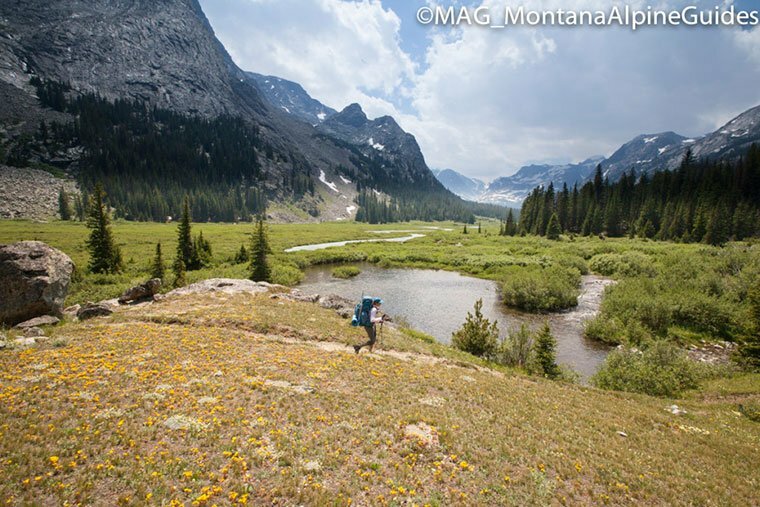 The Gannet Peak guided climb with MAG begins in the tiny town of Crowheart, Wyoming (pop. 141) on the Wind River Reservation (Shoshone and Arapaho tribes). The only establishment is a small general store that has the basic grocery amenities as well as native crafts, fishing tackle, ceramics, etc. We begin our journey at this store in order to arrange permission and transport across the reservation. Day 2: Strolling along near Dinwoody Creek and adjoining stream with Gannett Peak in distant storm. No alpine start today! We enjoy a slow morning eagerly awaiting the rising sun to hit camp as we sip our hot morning beverages. Our descent trek back to the Echo Lake area follows the same route as our ascent. Typically we stop for a lunch in the meadows and a quick dip in the glacier run off for the brave. Once again we will camp near Echo Lake. We will rise with the sun then head up and over Scenic Pass taking one last glimpse back at Gannett Peak. We meet our native transport driver at the Cold Springs trailhead. We typically stash some water and snacks to enjoy on our slow ride back down to civilization and its fast pace. If you have the time we recommend adding another day for weather, rest day, or to attempt other summits in the area. As Gannett more than 20 miles back many people choose to add on one more day in case of bad weather on the proposed summit day. One way or another you will need to drive to Crowheart, WY. This is where you will meet your guides and leave your vehicle for the duration of our trip. Flying in to Riverton, Lander, or Jackson Hole are the closest airports. Other larger airports include those in Bozeman and Billings MT or Denver, CO. Plan on having your own local transportation; it’s a good idea to reserve rental cars as early as possible. Transport from Crowheart, WY (where you meet your guides) to the Cold Springs Trailhead is provided by Ramona Oneal of Crow Heart. There are both camping and motel options for the nights before and after trips in near by Dubois and Riverton. 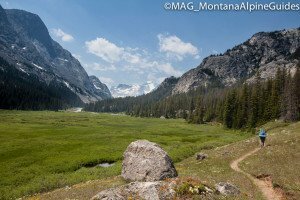 There are numerous places to camp, in the Shoshone National Forest and the Bridger-Teton National Forest. Visit the National Forest Service websites to locate sites nearest to Crowheart. We will provide all meals other than drink mixes and lunches/snacks. Plan your own snacks ahead of time, and consider doubling that ration for our summit day. All supplies should be purchased before the trip as supplies are limited in Crowheart. If you have dietary restrictions, allergies or preferences please let us know well in advance of your trip’s starting date. Porters are available upon request please inquire for details. Cell phones have patchy if any coverage up high. Most drinking water needs to be treated, either with iodine pills or filters. 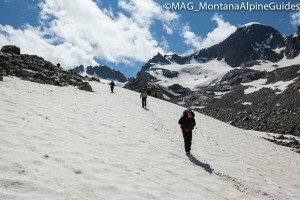 We practice Leave No Trace camping, hiking, and climbing techniques to leave the Shoshone National Forest as pristine as we found it, and we expect the same from all those who climb with us. Bring at least two zip lock bags to pack out all toilet paper used. There is nothing more disgusting and or a quicker way to ruin a great wilderness experience than a pile of someone’s used toilet paper. Don’t be that person, pack it in and pack it out. Staying extremely well hydrated is key to one’s success with exertion at altitude. If possible plan to arrive a few days early, and do some hiking above 8-9000’ in many of the beautiful near by mountain ranges. If you have had problems at altitude before please let us know prior to your trip and consult with your physician before you come. 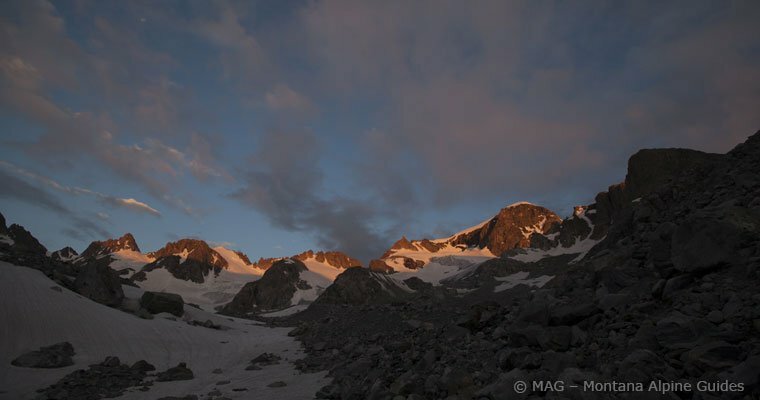 The weather is variable at best; nights are cool while the days can warm up substantially even in the alpine environment. Wind, sleet, rain, hail, even summer snow showers may be encountered; afternoon thunderstorms are fairly predictable. See our summer equipment list for your clothing and equipment lists. Gear should be light and in good repair, everything we bring will be on our backs. Minimize luxury items — which saves a pound on your back! The best luxury is a light pack! Many climbers take the option to hire a porter. Porters can carry 20-30lbs each. You should physically able to travel up to 8 miles a day with up to 2,500′ of gain for 5 days in a row with a 40-60 pound pack. Basic snow travel skills are helpful but not necessary for an ascent of Gannett Peak. We can cover theses skill sets as needed during our trip. Participants will become familiar with rope handling, traveling as a rope team, and technical gear use. It is worth training! Ask us about our training programs. The better shape you are in the more you will enjoy your time in the mountains. Gannett is a big peak that packs a big punch. Heavy packs, altitude, and the uneven terrain will fatigue us all. 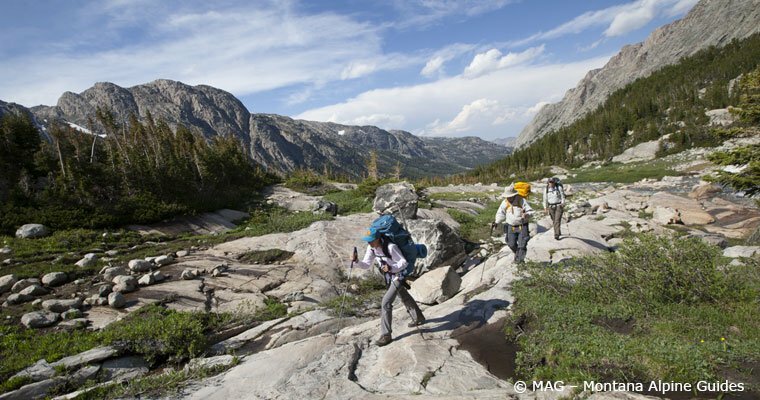 Adequate time with a pack and hiking for many hours is the ideal training for this trip. Be prepared to carry a pack between 40-60 lbs. depending on the weight of your personal gear Porters are strongly recommended and cost an additional $225/day. This allows participants to save energy on the way in and the way out so they can focus on the climb. A solid guide can show you the way, keep things safe, and make it fun. However there are several variables that can lead to failure for our climb. The most common are bad weather, inadequate training, and lack of fitness for the climb. To compensate for weather we can add on an extra “weather day”, for technical skills we offer our “Training Day”, and we offer porters to save you energy but the training is all on the participant. Success in the mountains begins with the first plan, and Gannett Peak is no exception. Transport and reservation fees for Wind River Reservation ($345/participant). This is paid the day we meet up directly to the reservation. Transport and reservation fees for your guide (divided among the group). NOTE: This is still the cheapest option as the trip from the reservation is 1-2 days shorter than other approaches, saving participants money for guide fees (~$370-$550/day), drive time, missed work, etc..